Ocean is one of the newest developments by Meriton on the beachfront at the Gold Coast. The site used to house the 22 storey International Beach Hotel built in the 1960’s. 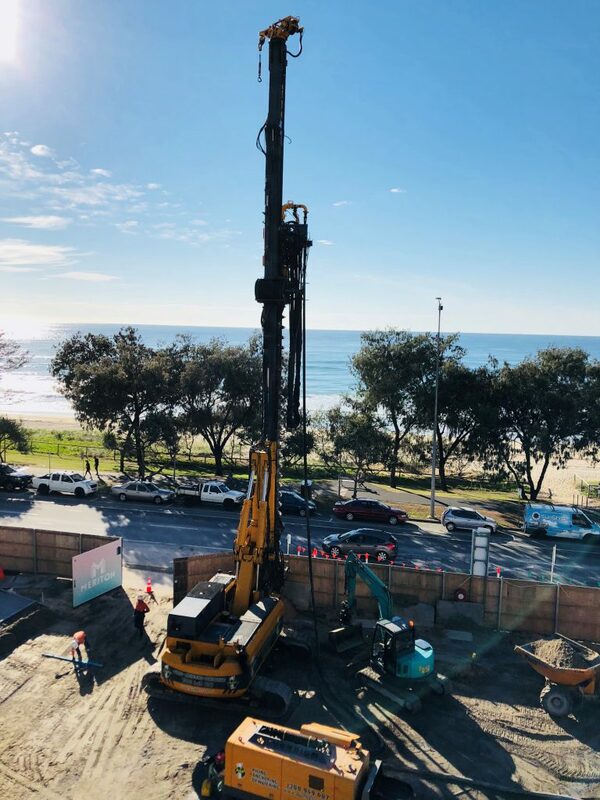 With the Gold Coast market still strong, the Australian building giant has started the development of its first truly beachfront block. ASP Piling has the privilege of installing secant piling, anchors and ADS the dewatering for the site. 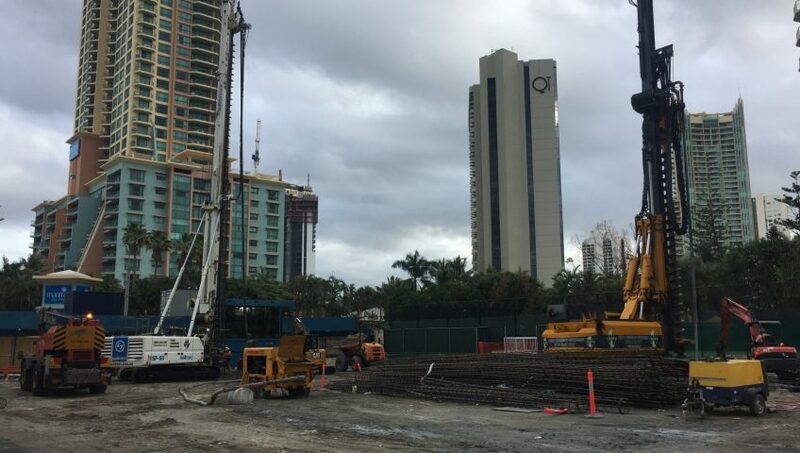 This 74 storey development will encompass residential apartments, a five star hotel and retail precinct. There will be a recreation area on the top floor including a pool and barbeque area. Mainland Civil have contracted ASP Piling for the retention and in-ground works on the site for the three level basement. Using a combination of secant piling, sheet piling and anchoring for almost 400 lineal metres of shoring. The piling includes the core lift pits and temporary sheet piling, as well as shot-crete finishing for some sections. Using a partial top down construction process allowed for a section of the site to be propped without anchoring as can be seen in the photographs. 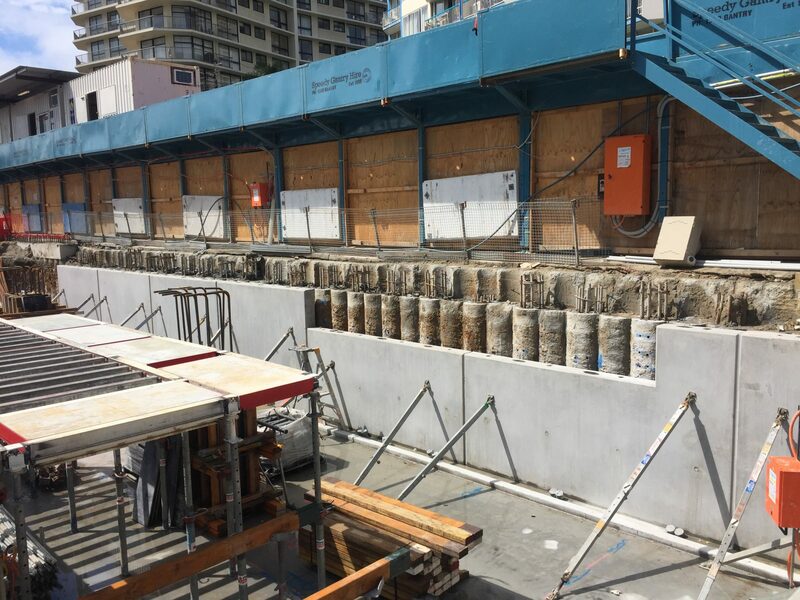 ASP has also completed the removal of the existing foundation piles from the previous building, The International Hotel which occupied the site. On a number of occasions, ASP Piling have been required to remove pre-existing foundation piles from the site prior to commencement of a new project. In doing so we have developed our own equipment to assist in the removal process, giving our clients additional services that we can provide on-site. The dewatering will be undertaken by Australian Dewatering Systems. 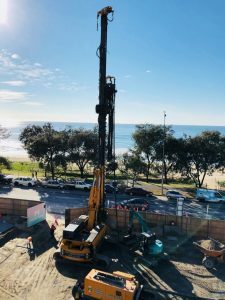 Being so close to the ocean, this property requires a combination of specifically tailored dewatering techniques providing de-watering to the required depth, including the cores and lift pits. Given the duration and depth of the excavation, our monitoring system will be used to ensure the system keeps the site dry throughout construction. A dewatering management plan and compliance monitoring are part of the services provided.